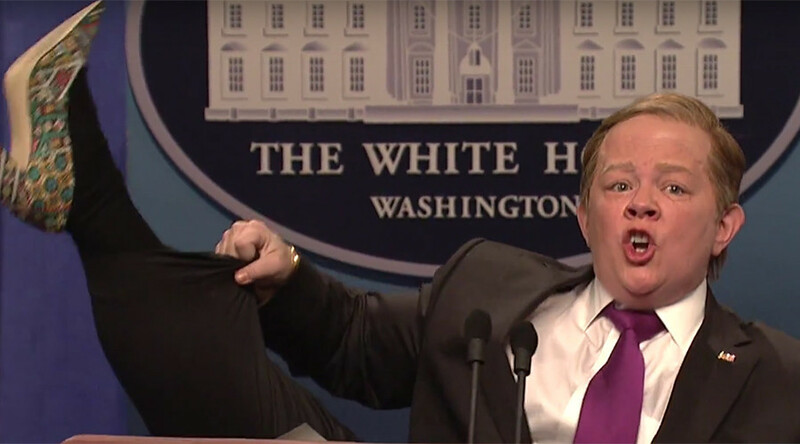 The Trump administration isn’t having an easy ride, and the latest edition of Saturday Night Live didn’t hold back its punches either, with White House Press Secretary Sean Spicer lampooned once again. Seemingly having taken the actual Spicer’s advice to “dial back” to heart, actor Melissa McCarthy returned with “new Spicy” only one week after debuting her character. Now apparently “calm,” Spicer tells “freak” Glenn Thrush of the New York Times to “not f with me,” while turning a leaf blower on another member of media. Referring to Nordstrom’s ditching of Ivanka Trump’s clothing brand as “light terrorism,” Spicer turns the briefing into a shopping channel selling one of Ivanka’s bracelets, which Spicer is wearing. “These babies are a real head turner,” Spicer adds, while lifting her leg into the air to show off one of her leopard print shoes. Trump was reportedly“rattled” by Spicer being played by woman, with SNL turning the screw even further this week by having Kate McKinnon play the part of Trump’s new attorney general, Jeff Sessions, who tells the press that “there are two kinds of crime, regular and black,” before Spicer pushes him off the podium. McCarthy played Spicer for the first time on Saturday February 4, after which Spicer himself told Extra that, while the skit was “funny,” he thought the actor “needs to slow down on the gum chewing; way too many pieces in there,” adding that she “could dial back” a bit. Trump has lashed out at SNL on a number of occasions for its satirization of him and his administration, branding the show “unwatchable” and “not funny” in a December tweet. He has yet to publicly comment on the comedy show’s latest sketches.